Events should have a program templates that will inform guests about the flow of activities. As defined, a program is an outline of the order to be followed; thus, it is a document that will help you achieve a smooth and organized flow for your event. And just like any event, a baptism should have a program that will tell the guests the time and location for the baptism ceremony and the reception. In this article, various baptism program examples are provided for you to use as a guide. 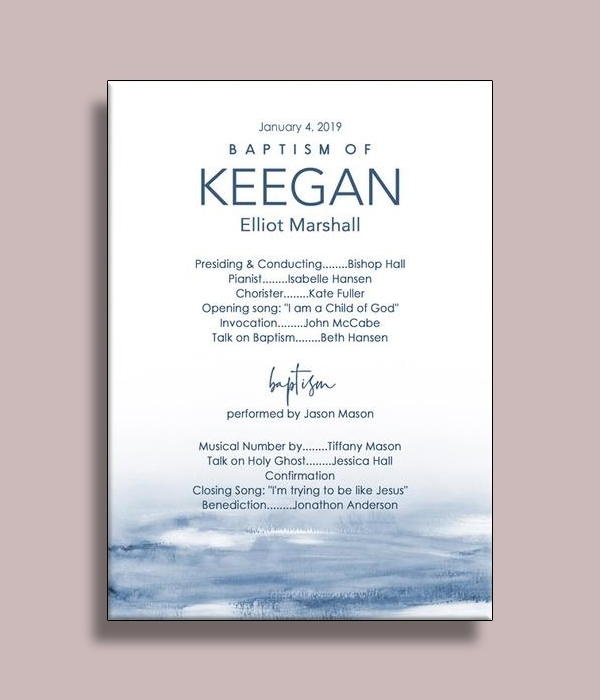 Looking at this baptism program example, you can see how the designer has provided a description for major activity relating to the baptism ceremony. Aside from that, pertinent information about the event such as the name of the child, date for the baptism, the godparents, location, and so on are all provided. 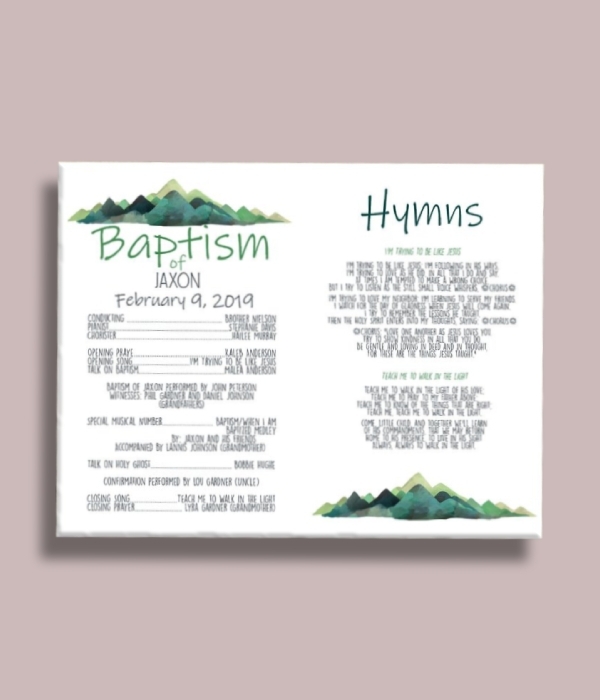 This is a good baptism program to use as a guide since it features a unique font and organized trifold layout. 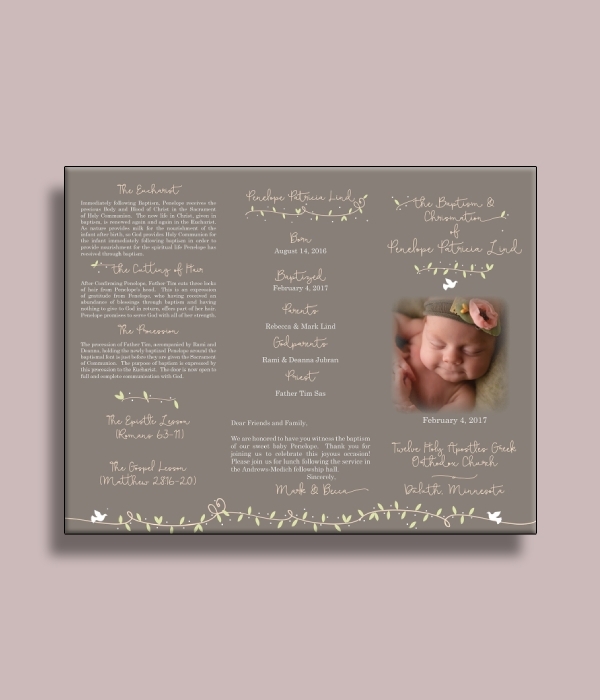 Do you want to have a cute program for the baptism of your child, nephew or niece, etc.? This example features dainty blush floral designs, chic font styles, and a clear layout that is perfect for disseminating pertinent information about the event. Contrary to the previous example, this program uses a bifold format which means you have more space to include necessary images, illustrations, and texts. A simple design doesn’t necessarily mean that it’s plain and boring. A simple design can look elegant with the help of good-quality illustrations, intricate font styles, and other design elements. 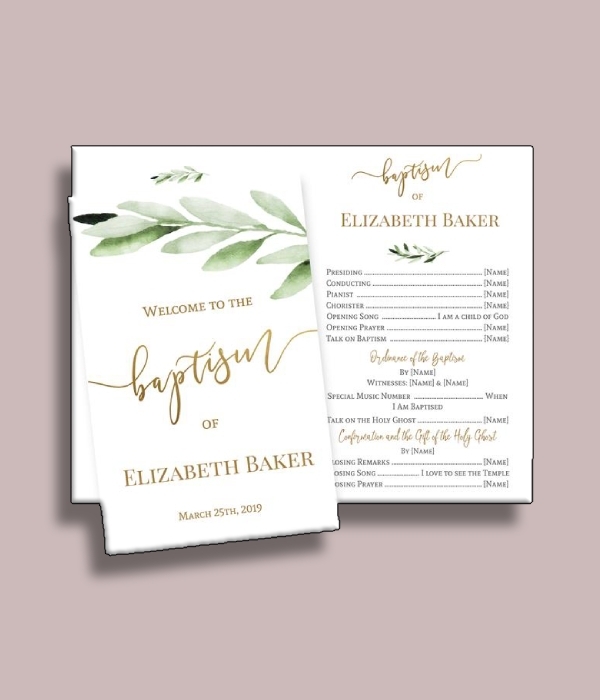 As you can see in this baptism program example, the minimal use of green leaves against a white background makes the program look sleeker and organized. If you have more activities or parts of the program, you should maintain balance by either using a smaller font size or limiting the white space. 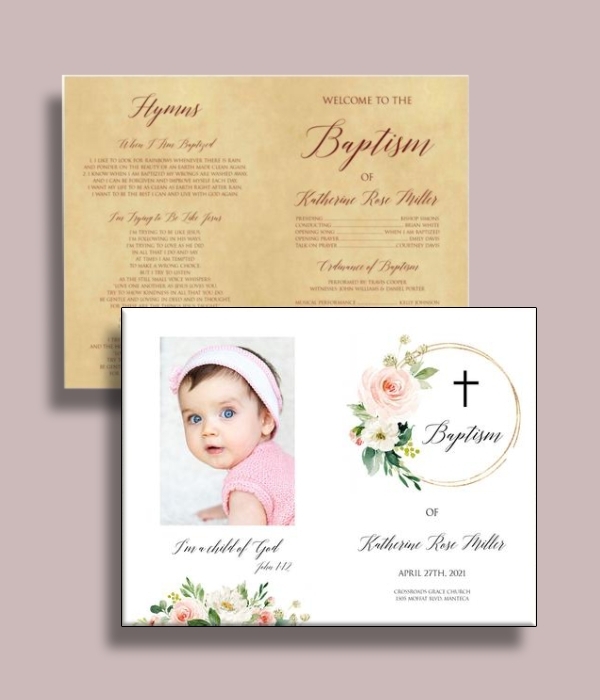 Go for a preppy, chic, and majestic program for the baptism of your baby girl or niece with the help of this baptism program example. 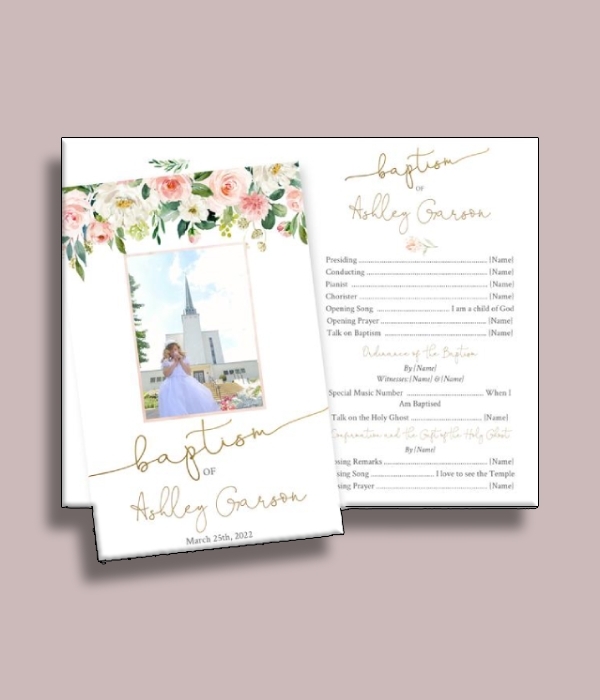 In this program, you can see how the designer has maintained a girly vibe with the use of colorful flowers, stylish font styles, and a feminine color palette. This is finish is quite easy to achieve even if you decide to DIY since its designs and layout are simple; you just need to have a well-thought-out theme and the right editing tools and skills. As they say, kids will really bring new colors to your life; thus, a rainbow-themed baptism program is only fitting and right. Since the event is centered on the baptism of a child, you can use bright colors to relate it to the event. 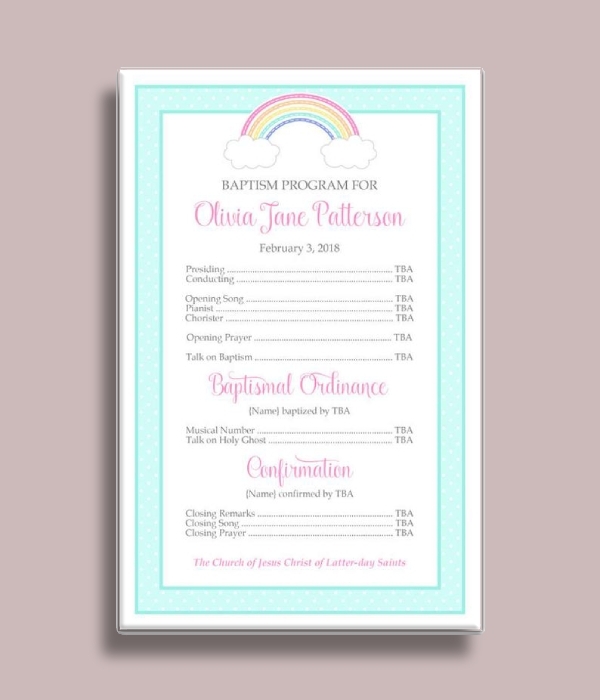 Similar to this baptism program example, the main theme is the rainbow, that’s why colorful border and colorful fonts are used. Design aside, the program also includes all the necessary activities regarding the event. Sometimes, you just need to be simple with the things that you do. 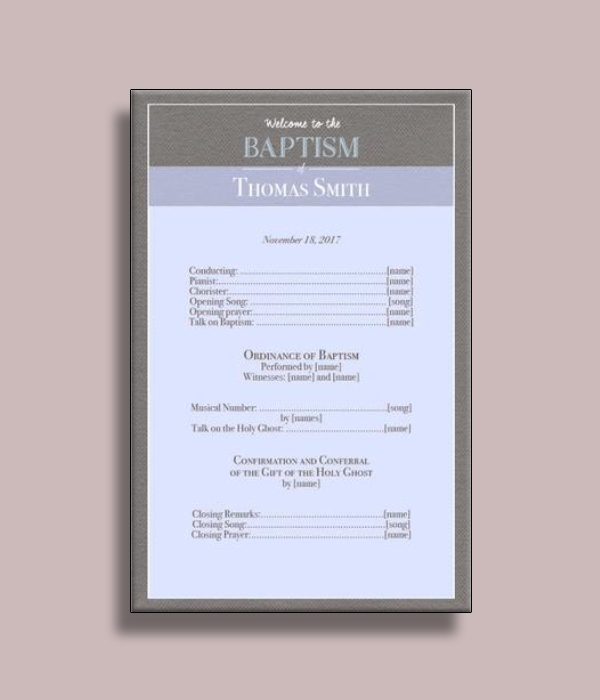 Just like this baptism program example, you can use a straightforward approach and simple design to allow you to emphasize the contents better. Similar to this, you can use only two matching colors to help achieve a minimalist look. And since this is a program, you should sequence the activities in the event properly and accurately. You can use this example as your program guide when you start to create one. Want to go for a navy-themed baptism? 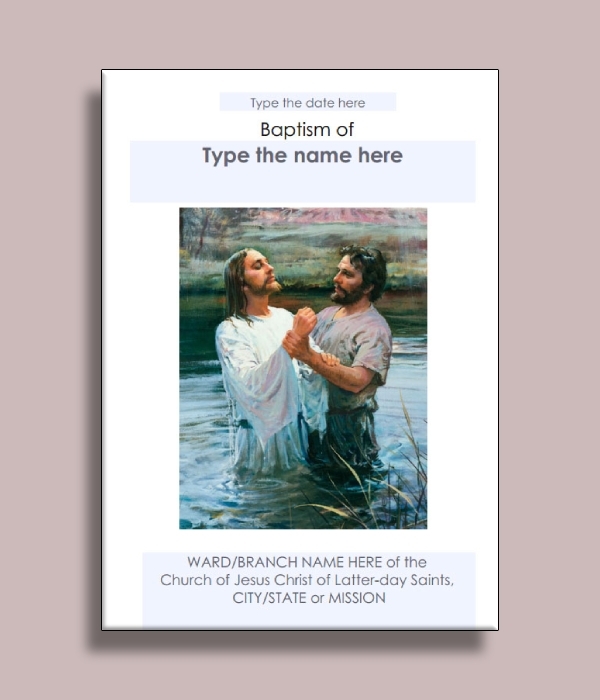 Make everything consistent with the theme by using this navy baptism program example. This program has used the colors blue and white, the colors commonly associated with the theme, as your program’s primary color scheme. You can either make a single page program or a bifold; what matters most is that you are able to provide the correct sequence of activities. In addition, you should prioritize accurately giving the time, date, and location of the event. A program does not necessarily need an outlandish and extravagant design and layout, so long as you are able to provide all the right details, then you’re good to go. 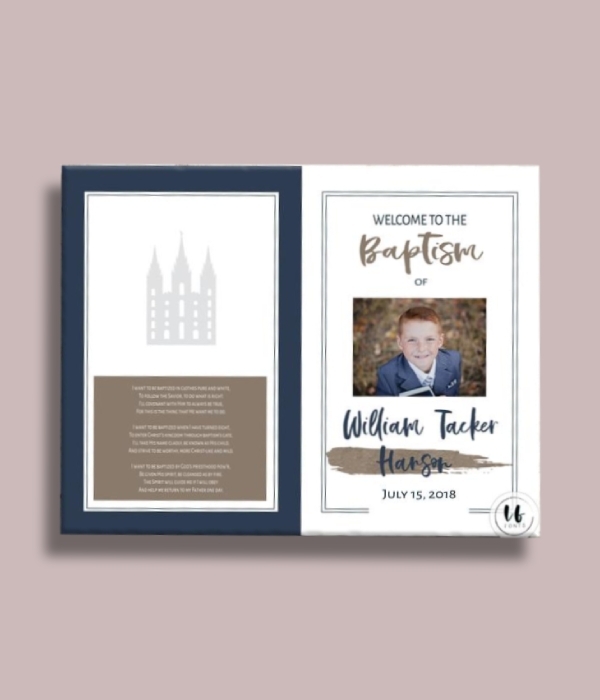 Just like this baptism program example, you can use a simple layout of how you present all the details, and you can balance this out with the help of a good quality background. 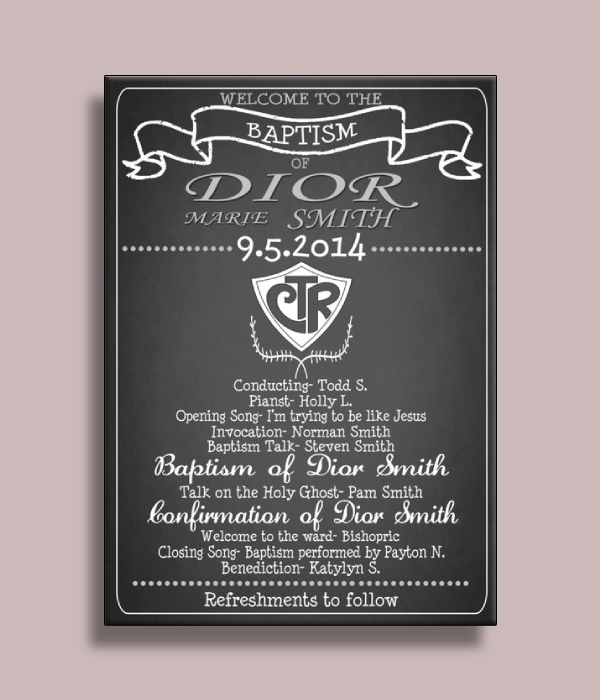 Depending on how you design and layout the program, it can also be used as a baptism invitation. Like a card, you can format your program to be foldable or bifold. Using this format will give you more space to put illustrations, designs, and texts. This is perfect if you want to provide quite a few details like a description for every activity, list out names of godparents, and so on. Since you have more space to work with, you may also have more space left as blank; make sure to balance the white space with the contents so that the program can look neater and more organized. A chalkboard design is quite commonly used nowadays; it has been used in countless menus, invitations, greeting cards, and so on. Hence, you can also use it for your baptism program. Looking at this example, you can see how well-structured and designed the program is. Although it has basic designs and illustrations, it has managed to achieve a stylish finish with the help of good format and unique font styles. Although it is possible to make your own baptism program, some churches provide ready-made programs that you can purchase. You will then need to write the details for the baptism on the program itself. This example uses a simple format and design with the image of Jesus’s baptism as the only major illustration. For a baptism program cover, the image used is appropriate and the message will be easily understood by the readers.